Just over a month separates “We, The Oregon Faithful” from our first glimpse of a re-tooled Lightning Yellow and Thunder Green squad with aspirations of Bowling in January. With fall camp just around the corner, recruiting will take a back seat to the maturation of the current lineup, but nonetheless will still produce underlying storylines heading into the fall. 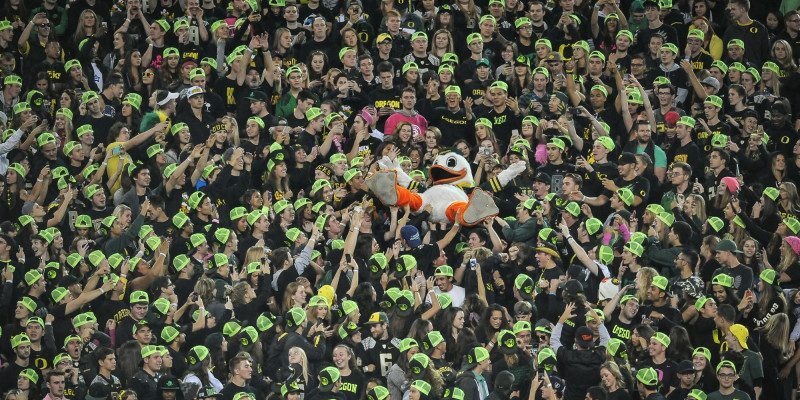 Oregon’s 2016 recruiting class is already gaining an identity and would do well to command the attention of several recruits with recent interest spikes. Once such prep, defensive lineman Teton Saltes (3-Star/Albuquerque, N.M.) is a new revelation on the recruiting landscape and has the Ducks firmly on his list going forward. At 6’6″, 240 lbs., Saltes would fit into the mold of Oregon’s staple drop-end. The term “high-motor” does not even begin to describe Saltes’ tenacity in the trenches, and provides the lanky big man the ability to run down opponents with ease. Saltes plans to commit following his senior season, but wants to take an official visit to Oregon during the fall campaign. With nothing guaranteed beyond this season at quarterback, Oregon’s gaze is well extended toward the future at the signal-caller position. Southwest-based dual-threat Tylin Oden (4-Star/Columbia, Tenn.) was in Eugene over the weekend and came away with a new wrinkle in his recruitment. Oden committed to Louisville in May, but recently opened his status when other quarterbacks jumped on board. While Mark Helfrich & Co. have not extended an offer, Oden expects it to come soon as Oregon doesn’t beat around the bush with unofficial visitors. To view Oden’s highlights, please click here.